Local agencies joined forces once again last month to provide much-needed support to homeless veterans and to help them get off the streets in Hillsborough County. 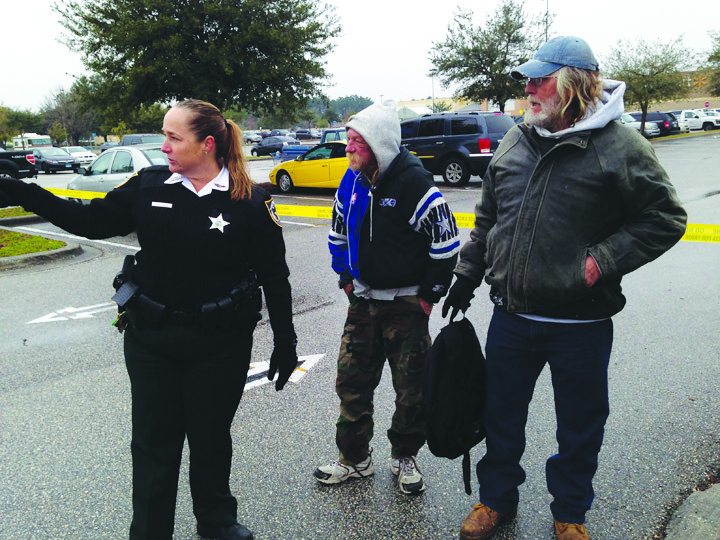 Donaldson, who was joined by HSCO Deputy Stephanie Krager said, the program features the VA’s Homeless Veterans Outreach Bus and allows the accompanying agencies and volunteers to work together and identify homeless veterans in Hillsborough County and provide many of them with a ride to this helpful event, which this time set up its home base at the Wal-Mart Supercenter, parking lot at 11110 Causeway Blvd., in Brandon. As the day began, various representatives from the participating entities helped qualified veterans fill out housing voucher applications, organized their military paperwork and assessed their needs for mental and physical health needs along with substance abuse counseling and other vital services. During the process, veterans were provided with a number of items donated to the event that included clothing and non-perishables from the employees of the Sheriff’s Office as well as from Honor Flight, a non-profit organization created solely to honor America’s veterans for all their sacrifices, by transporting them to see their war memorials. “The goal is to provide a path toward permanent housing and end the cycle of chronic homelessness for those who have served our country,” said area homeless coordinator, Bruce Roberts. For more information, visit www.hsco.tampa.fl.us.